Or maybe that’s not what you’re thinking. I’ve been watching my hives over the last week and a half, trying to make sure my busy little friends are comfortable and well fed. More importantly, I’ve been making sure the queens were laying eggs so that I didn’t just spend a lot of money for no reason. One hive is doing great – I see different stages of larvae on multiple frames, and I’ve seen the queen roaming her kingdom, gracing the common insect with her presence. The other hive, however, isn’t doing so hot. I haven’t seen the queen yet (I’ve looked through it multiple times), and I still don’t see any eggs or larvae. I called up Joel White, and he told me what to do: put a frame of brood from the thriving hive into the broodless one. The one rule was don’t transfer the queen. This makes me nervous – this seems like a very advanced beekeeping skill, and in fact this is the way you split a hive. So, it’s something that I definitely want to learn – but not necessarily a week after I officially started. But – the other option was helplessly watch my bees work themselves to death with no babies rising to take their places – which didn’t seem very positive. I lit my smoker (with a little trouble this time…), opened up the broodless hive, and gave it one more look to make sure I wasn’t simply missing the tiny eggs before. Still none. About 90% through this hive, my smoker died completely, so I had nothing to calm them with. I’d been relying pretty heavily on smoke in the past, but I didn’t have a lighter with me because my pocket lighter ran out of fuel, so I would either need to go to my barn to relight it (leaving the top off the hive for a while), or just keep chugging along with no smoke. I decided to see how they’d do sans-smoke. For the most part, I was surprised to find that they were almost as calm as when I smoke them – though I did have a few more bees sting my gloves than normal. I went through the thriving hive, found a frame of brood, and brushed all the bees off. That was nerve-racking. If they weren’t already agitated, bristles the size of a house ripping them away from their work would probably do it. Again, though – they were surprisingly calm. Obviously they buzzed in anger, and some kamikazed themselves at the screen over my face, but considering the number of them that I forced off the frame, it was minimal. After the frame was completely free of bees, I placed it in the other hive. I continued traversing the frames of the queened hive to make sure I wasn’t taking the only frame of brood, and saw the queen conversing with her subjects. I then replaced the stolen frame with a frame from the other hive – which they hadn’t even touched yet. Again – uneventful. Still no stings (in my skin) or pain. I’ll be checking on the queenless hive in a few days to see if they’re rearing a new queen, and the other hive will probably need a super (box of frames) added, assuming they’ve drawn out that new frame I put in today. I need to figure out a way to take pictures of my bees rather than relying on stock photography – but I don’t know that I have the coordination to hold a phone in one hand, and pounds of stinging insects in the other… One thing at at time! This entry was posted in Honeybees and tagged bees, honeybees on May 30, 2014 by David. If you’re looking for a repeat of my last blog, where my activity with bees ends with pain and suffering, alas, you will be disappointed! I learned from my previous mistakes, so I took the proper precaution this time around. I’d been anticipating getting bees for months now, reading, researching, trying to put things into practice – but until yesterday everything was pretty much only theory. Yesterday, I picked up my two nuc colonies from Joel White Apiaries (who I had a great experience with), and placed the nuc box itself where they would permanently go. I was at first under the impression that I should immediately transfer the frames to my permanent hives, but Joel said it would be better to let them orient themselves to the area first, so that they knew where they were before I also confused them by putting them in a new hive. So – easy enough. But the drive back home, with thousands of bees in the back of my SUV buzzing at the same noise level as my vehicle’s engine and air conditioner, was more than a little nerve-racking. I took all turns much slower than I normally do, because I kept having this image appear in my head, where the boxes tipped over, and two swarms of angry bees decide that I am their enemy. That didn’t happen. I got home and carried both to their locations, and removed the duct tape that was sealing their entrance. After only a moment, they were out and about – obviously wondering where in the heck they were. I put tape on the entrance of both boxes in two designs – firstly because I wanted them to easily differentiate which hive was theirs of the two, and secondly because I figured I could put the exact same tap design on the permanent hive, so they would recognize it quickly when their old box was gone. And – then nothing. I left them to do their thing. This morning, I donned all my protective gear (helmet with veil, gloves, hive tool and brush), and moved the nuc boxes off their blocks, and replaced them with the new 8-frame hives. After smoking them for a while, I precariously took each frame from the nucs and placed them in the new hives. It took a while, but believe me – patience was worth not panicking from making hasty mistakes. After getting all frames in place, I planned on giving them some sugar syrup to feed them – but apparently I did not make near enough. What I planned on dividing between the two hives barely was enough for even one. So – when I was done I came back and made a little more, which I have cooling in the fridge right now. As soon as it’s at a decent temperature, I’ll fill both of the top feeders up. So – there you have it. No drama, no getting to laugh at David’s misery… One project started, infinity minus one projects to go! 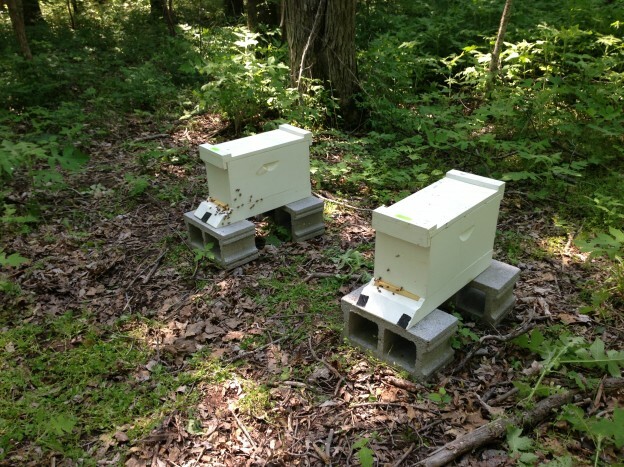 This entry was posted in Honeybees and tagged bees, honeybees on May 21, 2014 by David.